Welcome to the official website of the VIP+ project T-paper carried out by the Institute for Print and Media Technology at Technische Universität Chemnitz, Germany. pmTUC has developed a technology which allows the manufacturing of loudspeakers solely by means of conventional mass printing technologies on flexible substrates like foil or even paper. More precisely, we are talking about printed piezoelectric loudspeakers, i.e. a piezoelectric crystal transfers an applied AC voltage to a mechanical deformation and a vibration of the whole substrate. If the frequency of the AC signal is in the frequency range of 20 Hz to 20 kHz, audible sound is generated. In our case a piezoelectric polymer is sandwiched between two organic electrodes, i.e. we have truly fully plastic speakers without magnets. All layers can be printed step by step on a substrate but thanks to new developments during the last three years, we are now able to integrate all electronic layers within a special paper – the tone paper – or shorter T-paper – was born making it possible to print on both sides of the paper color pictures or whatever you are used to print (or write) on paper. The printed electronics part keeps hidden and invisible. At the starting point of this project, the realisation of the T-paper is based on a semi-automatic sheetfed process with low efficiency and throughput. However, first applications could be successfully demonstrated like the T-book in 2015 – a unique photo book with speaking images. 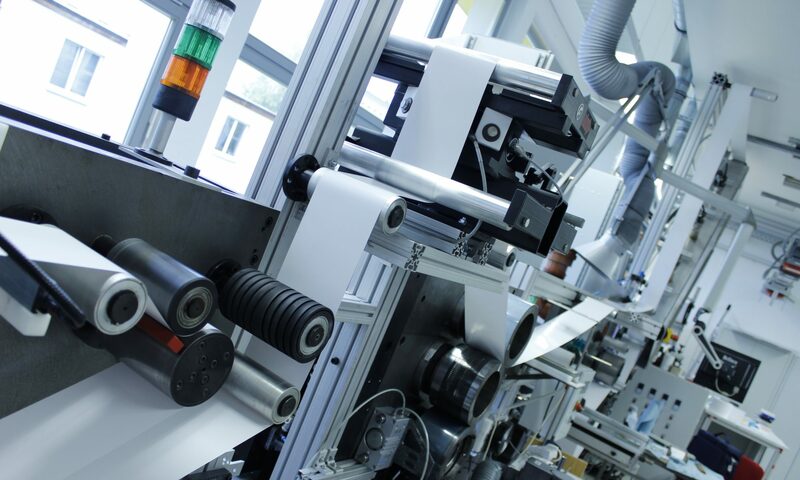 Now, main aim of the VIP+ project T-paper is to transfer the inefficient sheetfed manufacturing to a high-throughput roll-to-roll pilot line at one of pmTUC’s R2R printing presses. This includes the development and validation of a stable R2R printing process of all functional layers, the inline polarisation of the piezoelectric material but also post-press technologies like lamination and folding. We are keen on getting your inquiries, your ideas for cooperation and your valuable feedback! If you would like to get into contact with us, please fill in the following form. Thanks!